l. Give us some info on the band's past, present and future. Jacek: When I started Cold Therapy as a solo project, I was a bit demotivated by the situation with Traumatize, which got disbanded. My musician-friends encouraged me to not give up and start working on something new... so here we are to this day and everything is going great. My first vision of CT was to ﬁnally make music which I like the most, experiment more with the sound, make it more personal, as before I was always making mostly danceable aggrotech. I wanted make it a "new era" for my musical experience. That's how it all started and ﬁnally on the first album "Embrace the Silence" you could hear some songs which were slow and experimental, which fitted more to the style of our actual sound, and some songs still more into aggrotech style. 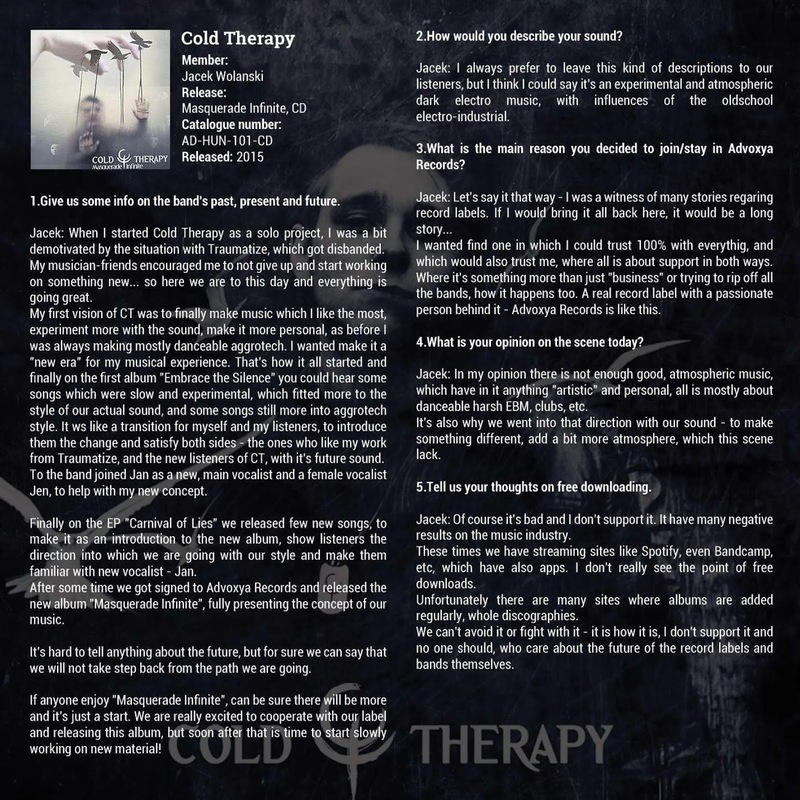 It was like a transition for myself and my listeners, to introduce them the change and satisfy both sides - the ones who like my work from Traumatize, and the new listeners of CT, with it's future sound. To the band joined Jan as a new, main vocalist and a female vocalist Jen, to help with my new concept. Finally on the EP "Carnival of Lies" we released few new songs, to make it as an introduction to the new album, show listeners the direction into which we are going with our style and make them familiar with new vocalist - Jan.
After some time we got signed to Advoxya Records and released the new album "Masquerade Inﬁnite", fully presenting the concept of our music. It's hard to tell anything about the future, but for sure we can say that we will not take step back from the path we are going. If anyone enjoy "Masquerade Inﬁnite", can be sure there will be more and it's just a start. We are really excited to cooperate with our label and releasing this album, but soon after that is time to start slowly working on new material! Jacek: I always prefer to leave this kind of descriptions to our listeners, but I think I could say it's an experimental and atmospheric dark electro music, with influences of the oldschool electro-industrial. 3. What is the main reason you decided to join/stay in Advoxya Records? I wanted ﬁnd one in which I could trust 100% with everything, and which would also trust me, where all is about support in both ways. Where it's something more than just "business" or trying to rip off all the bands, how it happens too. A real record label with a passionate person behind it - Advoxya Records is like this. 4. What is your opinion on the scene today? Jacek: In my opinion there is not enough good, atmospheric music, which have in it anything "artistic" and personal, all is mostly about danceable harsh EBM, clubs, etc. It's also why we went into that direction with our sound - to make something different, add a bit more atmosphere, which this scene lack. 5. Tell us your thoughts on free downloading. Jacek: Of course it's bad and I don't support it. It have many negative results on the music industry. These times we have streaming sites like Spotify, even Bandcamp, etc, which have also apps. I don't really see the point of free downloads. Unfortunately there are many sites where albums are added regularly, whole discographies. We can't avoid it or ﬁght with it - it is how it is, I don't support it and no one should, who care about the future of the record labels and bands themselves.